For the first time in school history, Adair County will have a middle school volleyball team. They will get their start today by hosting Campbellsville at 5 p.m. with a seventh and eighth grade game scheduled. After hosting their first game, the Lady Indians will travel to Russell County on Tuesday and play at Taylor County next Thursday. Coaches Jamie Bailey and Julie Spinks are excited for the program to start and are ready to get the season rolling. “We are entering the season with great expectations,” Coach Bailey said. 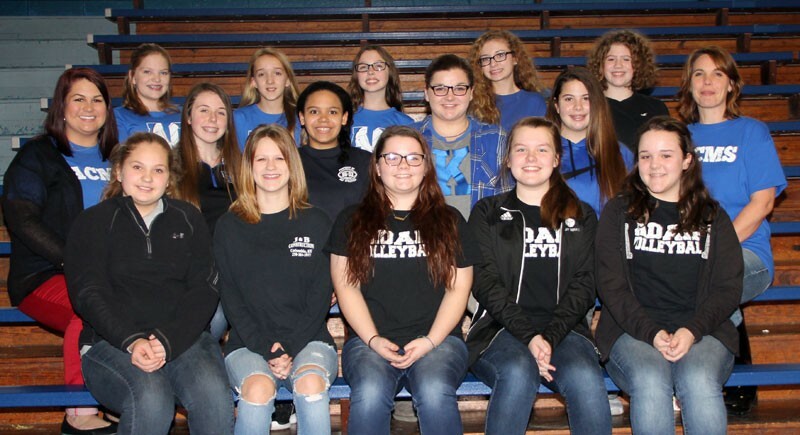 Adair County Middle School volleyball team front row (from left) Hannah Philpot, Kristina Mahieu, Morgan Spoon, Kennedy Stephens and Kiara Collins. Middle row (from left) Coach Jamie Bailey, Brennan Wethington, Monique Miller, Molly Hadley, Madison Riter and Coach Julie Spinks. Back row (from left) Rachel Brown, Alyssa Simpson, Eliza Spinks, Ashton Flatt and Leah Dykes. Not pictured: Briley Burns.